How much does context matter? This double bill of The Two Scottish Davids at the Traverse brings together a play each by David Greig and David Harrower originally written for completely different venues and contexts. David Greig's Letter of Last Resort comes from the Tricycle Theatre's The Bomb – a partial history season, which staged ten plays by nine writers as two different evenings of theatre all about nuclear weapons. David Harrower's Good With People apparently comes from the much less context-heavy Scottish A Play, A Pie, A Pint season, produced by Òran Mór and Paines Plough. That is still a context though, for a single, short, satisfying play. Both plays also originated in much smaller venues. 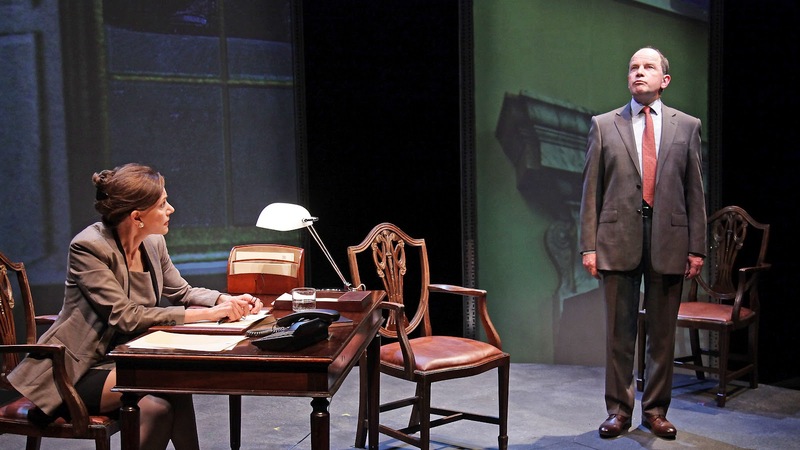 What unites the two plays, at least tangentially, is their subject matter. Obviously David Greig's play is about nuclear weapons. It had to be. But, perhaps by virtue of his being Scottish, while this is a play set in England, in the Number 10 office of a newly elected prime minister (Belinda Lang), it remembers that the ultimate nuclear capability of the United Kingdom is on board submarines launched into the Atlantic from a base in Scotland. David Harrower's play is set in the town where that submarine base is. Thanks to Dan Bye's Entertainment the other day, I was reminded that the subject of Britain's nuclear capability's Scottish base is now a current political hot potato, since it constitutes a major sticking point in Scotland's current struggle for independence. However, splicing these two wildly disparate plays into a makeshift double bill to reflect this state of affairs doesn't quite work. For a start, sticking them on in Traverse One turns two intimate chamber pieces into something that feels as if it's expected to behave like a big old State-of-the-Nation play. A feeling bolstered by the large, carpeted sets and polished furniture that both – entirely separate – teams have opted for. But since neither play is, neither play does. So the double bill feels a bit funny. There is also the issue of running order. Apart from finding David Greig's play far more my cup of tea, I also thought it had a sense of scale that really demanded it come after the interval. Going from big picture to small picture seemed to wrong foot both pieces, whereas I think stepping back from a little picture to see the bigger picture might have worked far better. I should add, however, that the performance I saw was also interrupted by a fire alarm. At the end of a long day, adding almost an hour onto the running time of the show might have set me slightly against David Harrower's offering from the get-go. Which is unfair, and I do apologise if that is the case. As it is, David Greig's play also wrong-footed me at first. It might be that it was coming into a large venue and hearing an actor actually raising their voice in order to reach the back rows for the first time over a week. But I've seen Daniel Kitson in Trav.one and you don't need to raise your voice to be heard. So, yes, the acting style contained so much acting that it took a bit of getting used to. This is a very, very old-fashioned production. Part of the reason for this is that this slightly retro- feel is also written into the text. At one point Greig's female Prime Minister knowingly comments “This isn't an episode of Yes, Prime Minister”. The observation is spot on. It's precisely what I was worrying for at least the first fifteen minutes – that Greig, having got short of time, had just copied and pasted the Nuclear Deterrent episode into a Word.doc and handed it to director Nick Kent. Lang's co-performer Simon Chandler is also turning in an admirably understated Sir Humphrey impression. But then, I do like Yes, Prime Minister an awful lot, so, even while wondering what on earth had happened to the mind of the brilliantly versatile playwright who wrote San Diego and Midsummer, I was enjoying myself. And, to be fair, marvelling yet more at Greig's apparent ability to write successfully in literally *any* register he chooses. As well as Yes, Prime Minister, another reference given is Pirandello. I'd suggest that a sort of Stoppard-y/Frayn-y might be nearer the mark. That's not a criticism, merely an observation. The piece makes its point, though. Coolly and unsentimentally it reminds us of the sheer zero-sum-game insanity of nuclear weaponry. Harrower's offering could be drawing a wider analogy about the actual arrival of the base up the road from Helensburgh with this story of a young man whose father worked on the base turning up to stay in a guest house run by the mother of a local boy whom he bullied at school over a decade earlier, but the play seems more interesting in character and truthfulness than clunky metaphor. To be totally straight, it's really not my favourite sort of play. I think it is probably quite a well done version of not-my-favourite-sort-of-production-of-not-my-favourite-sort-of-play, but, well, you see the problem. Blythe Duff and and Richard Rankin turn in detailed, wholly believable performances as the damaged mother and the changed young man, although I'd be tempted to say that even with these, the production still feels a bit marooned on its large, low, rectangular plinth, set out in the middle of the larger blackness of the Traverse's main stage. The lighting (Oliver Fenwick) is pretty, and George Perrin has added a couple of bits of stage-picture to artsy-up the production. And it very effectively conjures a real sense of the place and of its past, but, like I say, not really my bag. So, as I say, I'd be interested to see how they worked the other way around – more like Dr Strangelove, I'd suggest; starting with an interesting but ostensibly normal situation, and building up to the near-farcical use of logic in Letter of Last Resort. Still, for those who like their theatre a bit straighter this is definitely a well-made, if slightly wonkily curated, double bill.